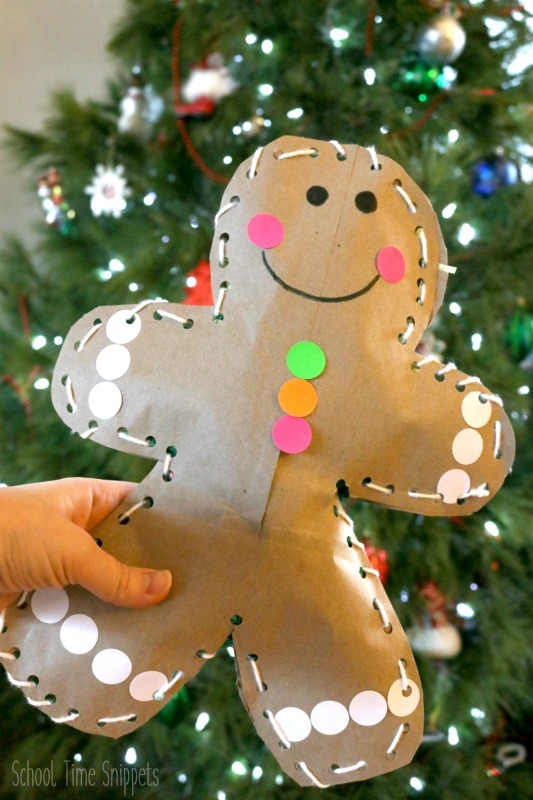 Here is a fun and festive gingerbread man craft to make during the holidays. This gingerbread craft will delight kids of all ages as they make their very own Jumbo Stuffed Gingerbread Man using household materials. 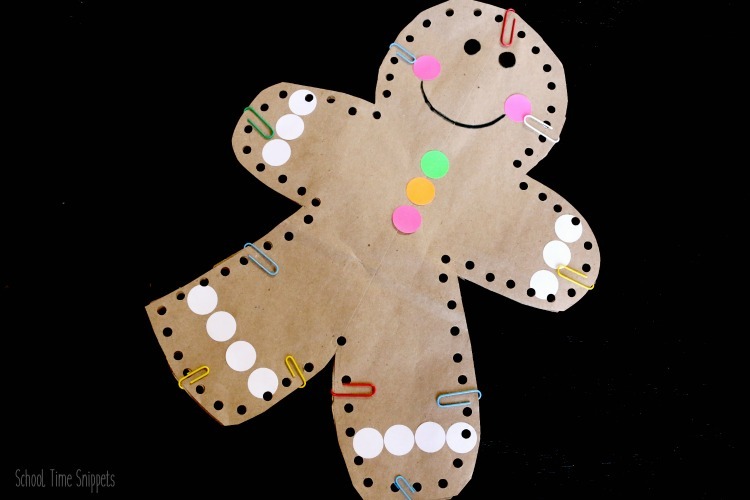 This gingerbread man craft is a great way to sneak in fine motor skills! 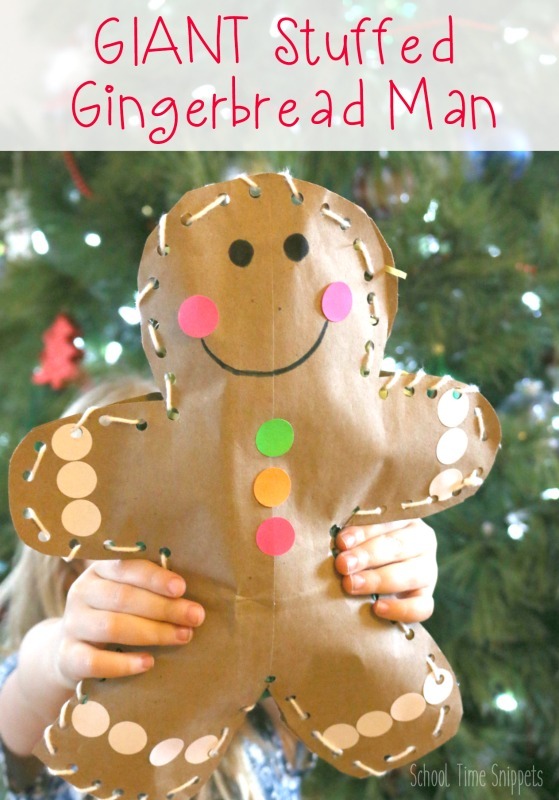 This Jumbo Stuffed Gingerbread Man is an adorable Christmas craft! Now if only it were edible ; ) Right?! Ready to make a jumbo stuffed gingerbread man?! 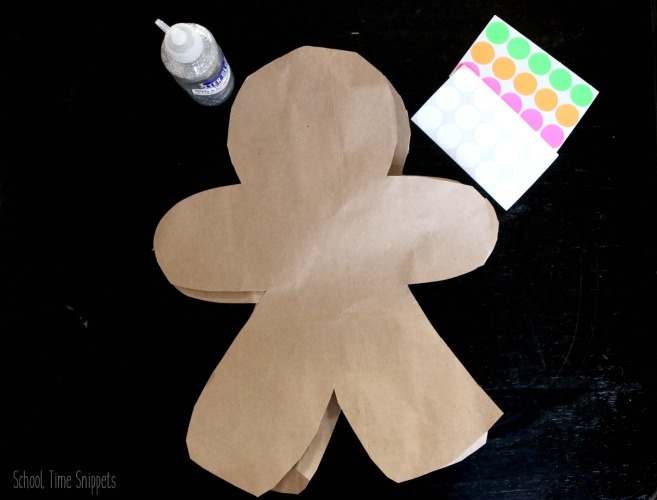 From a paper grocery bag, draw out a gingerbread man outline with a pencil. With scissors, cut the outline out. If your paper bag has writing on the front, the outlines around so that the gingerbread man body is all brown. ** As noted in our supply list, another option is to trace and cut the gingerbread man's body from brown wrapping paper . The large roll can then be used for wrapping paper! Next, we decorated our gingerbread man with dot stickers and added eyes and a smile with a sharpie marker. To keep the two outlines together, I placed paper clips around the gingerbread man. This helped with the next step... using a hole punch! With a hole punch, start at the top and work your way punch holes around the gingerbread outline. Ours were pretty close together, but fair warning that so many holes close together may tire little hands while lacing the yarn through the holes. Although, bigger gaps might allow for the stuffing to pop out. ** If you choose to space the holes further apart, you may want to have a stapler handy for when you stuff the gingerbread man's body. Alright, our gingerbread man's face is decorate, the holes are prepped... now it is time to add the icing! Aka.... white yarn!! Use a paper clip to hold the yarn in place and from there begin to lace the yarn in and out of the holes-- all the way around the gingerbread man's body. 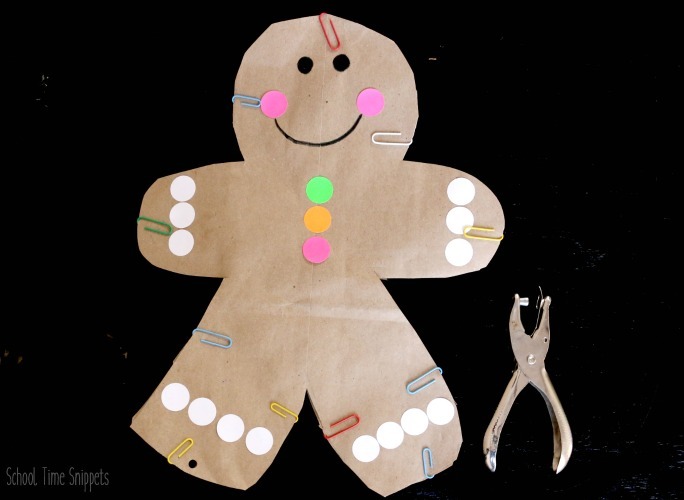 This gingerbread man craft is a fun, hands-on way to work on fine motor skills for preschoolers - 2nd grade! Who wouldn't love to have their very own giant gingerbread man?!! He's the perfect buddy to have this Christmas! Once you lace the yarn almost all the way around the body, stuff the gingerbread man with Easter grass, tissue paper, paper towel, etc. 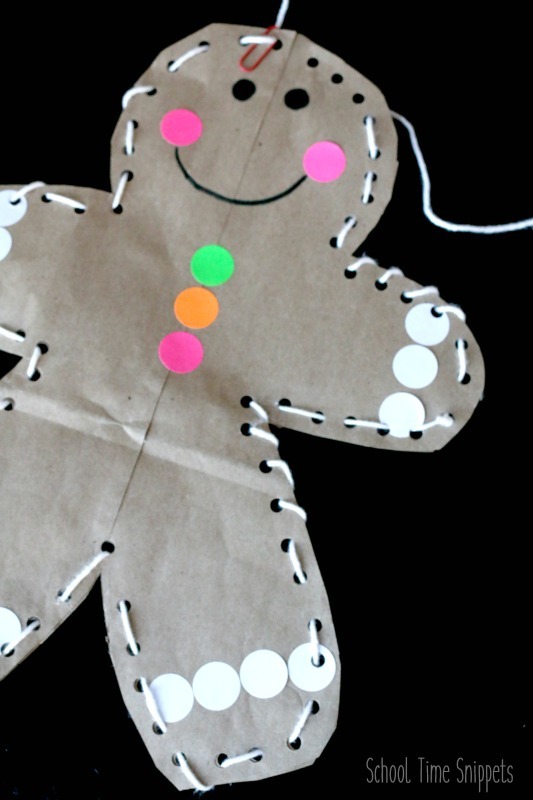 Use a pencil or some other long object to push the stuffing into the gingerbread man's legs and arms. Finish lacing the gingerbread man and tie the ends of the yarn together. And your gingerbread man craft is complete!! ** If desired, continue to decorate your gingerbread man with glitter glue and/or other festive decorations! 2 comments on "DIY Jumbo Stuffed Gingerbread Man Craft"
Such a "sweet" craft for preschool and kindergarten. Thanks for the inspiration. Aww, thanks Laura for taking the time to comment! Hope you enjoy a similar craft with your little one(s).